Copyright ©2018 Out in SA, Inc. all rights reserved. Out in SA is a wholly owned subsidiary of Euclid Media Group LLC. Reproduction in whole or in part without written permission of the publisher is prohibited. Publisher does not assume any liability for unsolicited manuscripts, materials, or other content. Any submission include a stamped, self-addressed envelope. All editorial, advertising and business correspondence should be mailed to 915 Dallas Street, San Antonio, TX 78215. Euclid Media Group, LLC (“us”, “we”, or “our”) operates the https://www.outinsa.com website (the “Service”). Please read these Terms and Conditions (“Terms”, “Terms and Conditions”) carefully before using the https://www.outinsa.com website (the “Service”) operated by Euclid Media Group, LLC (“us”, “we”, or “our”). Euclid Media Group, LLC has the right but not the obligation to monitor and edit all Content provided by users. While the administrators and moderators of this user generated content or postings will attempt to remove any generally objectionable material as quickly as possible, it is impossible to review every message. Therefore you acknowledge that all posts made to these forums, opinions posted and user generated content express the views and opinions of the author and not the administrators, moderators, outinsa.com or its affiliates and parent company or companies or webmaster and hence will not be held liable. Out in SA does not require registration to access or view any free content and services within the site. 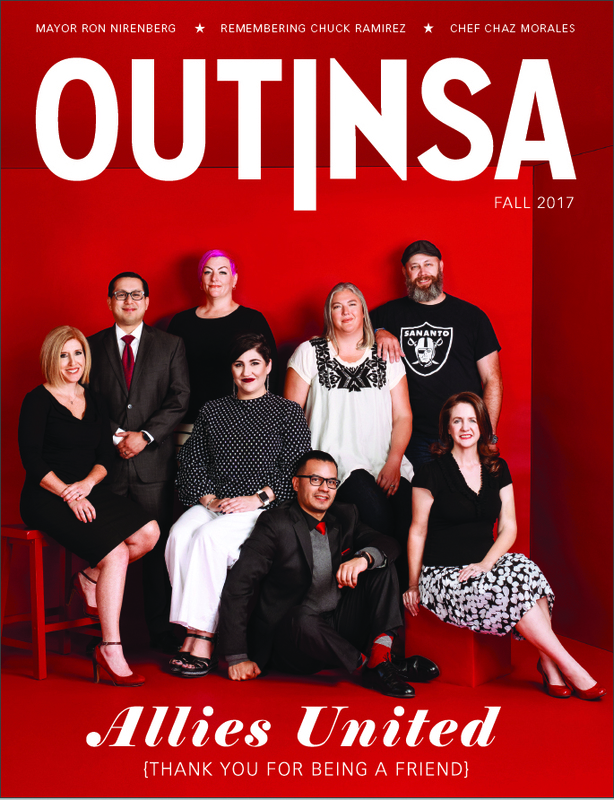 Employees of Out in SA, Inc., their parent, subsidiary, and affiliated companies, and members of the immediate family or household of anyone so employed are ineligible to participate or win. No purchase or internet access necessary. To enter, complete a 3×5 card with your name, home address, age, telephone number and e-mail address (if you have one) together with any other information required in the contest description. Submit your entry to Out in SA Contests, 915 Dallas Street, San Antonio, TX 78215. Contest begins and ends as specified in the contest description. All entries must be received by the date required in the contest description. Entry limited as specified in the contest description. Incomplete entries are void. No mechanically reproduced entries permitted. Not responsible for lost, late or misdirected entries, illegible entries or entries containing incorrect information. Not responsible for any problems or technical malfunctions of any telephone, computer or on-line or Internet systems or services. Entries become the property of the Out in SA and will not be acknowledged or returned. Prize winners will be selected from a random drawing held on or about the date specified in the contest description from among all eligible entries received. Prize drawings will be conducted by Out in SA Contests, 915 Dallas Street, San Antonio, TX 78215. The Prizewinners will be notified by mail, email or telephone. Odds of winning depend on number of eligible entries received. Any other expenses, including travel and lodging expenses, relating to the prize package not specified are the sole responsibility of winners. Open to legal U.S. residents who, as of the date specified in the contest description are the age specified in the contest description. All contests are open to legal Michigan residents only (ages 21 and over unless otherwise stated). All contests are void where prohibited. All federal/state/local taxes are the sole responsibility of Prizewinners. All federal/state/local laws and regulations apply. Potential Prizewinners must execute an Affidavit of Eligibility/Release of Liability/Prize Acceptance Form within 15 days of notification. Noncompliance/return of prize notification as undeliverable will result in disqualification and selection of an alternate winner. By entering, participants agree to release and hold harmless Out in SA, Inc., their parent, subsidiary and affiliated entities, directors, officers, employees, attorneys, agents, and representatives from any damage, injury, death, loss, claim, action, demand, or other liability that may arise from their acceptance and/or use of any prize or their participation in this promotion, or from any misuse, or malfunction of any prize awarded. Winner is not entitled to transfer prize or obtain a substitute prize. Out in SA, at its sole discretion, may substitute a prize of equal or greater value. Acceptance of Prize constitutes consent to use winner’s name and likeness for editorial, advertising and publicity purposes without additional compensation, except where prohibited by law. Out in SA further reserves the right to cancel, terminate or modify the sweepstakes in the event the sweepstakes is not capable of completion as planned, including infection by computer virus, bugs, tampering or technical failures of any kind. By participating, entrants agree to be bound by these Official Rules and the decision of the judges. A reader is eligible to win a Out in SA prize only once every thirty (30) days. All winners must present valid identification Winners must pick up their prize at Out in SA offices between 9am and 5pm Monday through Friday, unless alternate arrangements have been made through the Out in SA Promotions Department. Winners will have thirty (30) days to pick up their prize. Failure to pick up their prize will result in forfeiture of said prize. Out in SA reserves the right to disqualify any contest participant for failure to comply with the rules. All decisions of Out in SA are final. Out in SA reserves the right to supplement or change contest rules at any time. Out in SA reserves the right to make changes to the rules of any contest. Material changes will be published in the paper or otherwise publicly disseminated.